Stylish Hitchcock movie about a wheelchair bound photographer (James Stewart) who spends his time spying on his neighbors from his window appartment. One day he becomes convinced that one of his neighbors has killed and buried his wife. With the help of his girlfriend (Grace Kelly) and his nurse, they decide to lead their own private investigation. 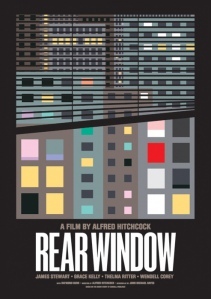 I’ve enjoyed almost every Hitchcock movie I’ve seen, but for some reason, “Rear Window” will always be my favourite. It’s a movie that has aged perfectly well; I’m sure it’s still as suspenseful as it was over 50 years ago. So well made, it inspired a TV remake in 1997 with Christopher Reeves, and more recently a movie called “Disturbia” (I’m sure you’re familiar with this one). One of the all time greats! The best hitchcock movies: Rope, Rebecca, North by Northwest, Strangers On a Train, vertigo, dial M for murder, Frenzy, The man who knew too much, The lady vanishes, Lifeboat, Suspicion, Notorious, Shadow of a doubt, saboteur, spellbound. The good hitchcock movies: 39 steps, sabotage, Mr and Mrs smith (a comedy), The wrong man, marnie, The birds, Torn curtain, Family plot, stage fright, I confess, The trouble with harry, To catch a thief and finally young an innocent. hehe try to watch the other ones aswell! You might enjoy them if u liked the ones u mentioned above. I love Rope! Watched this film for the first time last night. Started 2013 having seen no Hitchcock’s, now seen To Catch a Thief, Birds and now Rear Window. I think each one is getting better than the last! What’s next if I’m to keep the run going?! Thank you Danielle for your trust I appreciate it! If you’re asking me and you are, I think you should watch Disturbia, not because it’s a great movie, but because it’s a modern take on Rear Window. I won’t call it a ripoff because I actually enjoyed it and I won’t call it a masterpiece either. It falls somewhere in between.